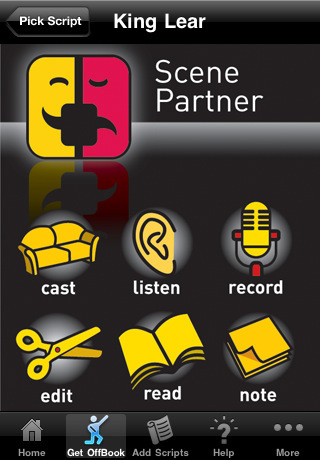 Scene Partner is an actor’s app that allows you to rehearse your lines without having to bug your friends constantly. 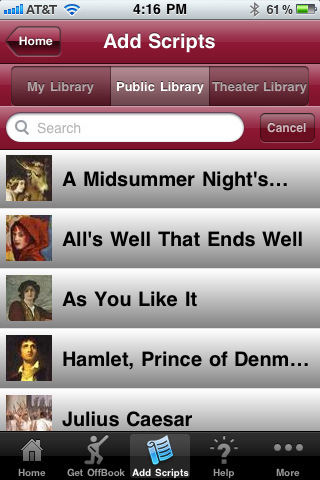 The app was released by My Theater Apps for an iPhone, iPod Touch, and iPad and costs $4.99. For those of you who are struggling actors there is a lite version offered for free. One of the hardest parts of acting is memorizing countless lines and then training yourself to deliver them accurately. This takes a lot of practice, patience, and support from friends or family in helping you execute your lines and cues. Scene Partner can step in to take the place of just about anyone who would be helping you learn your lines aside from an actual acting coach. All the bases are covered with this app. You can use a recording to play back your lines or integrate your script into the app by using the Scene Partner website. When you open up the app you are prompted to sign in to the website in order to begin downloading your scripts, but if you do not want to bother with this you can use the two bonus scripts—Shakespeare’s plays, King Lear and As You Like It—that the app comes with. One quick gripe, I know that $5 is not a lot to pay for the type of technology offered in Scene Partner, but the voice that reads the lines to you (so that you can get a feel for timing and pronunciation) is so robotic and glitch-y sounding that it is distracting. I guess the one redeeming quality is that it pauses at the commas. You have a choice of two voices, a male, Ryan and a female, Heather. You can play a whole scene with multiple characters, you can isolate lines, you can record your own voice and play it back, there are dozens of possibilities. Scene Partner is never going to be as good as having someone physically there to read lines with, but it is a great alternative. The plus about using this app is that you are not on somebody else’s time. AppSafari review of Scene Partner was written by Vanessa Paszterko on January 25th, 2011 and categorized under App Store, Notes, Productivity. Page viewed 4504 times, 1 so far today. Need help on using these apps? Please read the Help Page. I used this app for Dixie Swim Club and it was a great help to me. It allowed me to access the script at any time in various formats which helped me to learn the lines quicker and easier than I might otherwise. The script was the same price as buying it online, so with the extra benefits, it was a total no-brainer to buy and use Scene Partner. As the list of available plays continues to expand, it will be a staple to all actors.